Volunteer on Vacation in Hawaii! Voluntourism opportunities for Hawaii vacations with discount accommodations for volunteers! 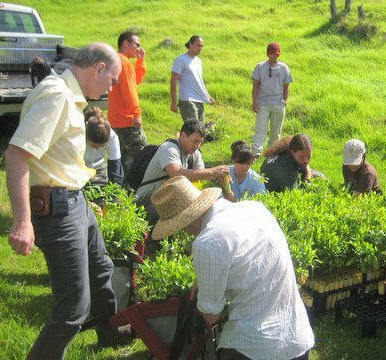 Volunteers on Maui, Hawaii, work to restore native Hawaiian plant species. The Hale Hookipa Inn in Makawao, Maui, Hawaii offers a 5% discount to guests who volunteer at least one full day on their vacation at an organized effort, and 5% of the cost of the guest's stay will be donated to the organization for which they volunteer! The Pacific Whale Foundation also has a volunteer on vacation web site featuring voluntourism opportunities like cleaning up your favorite Maui beach. A volunteer on vacation in Hawaii rests on the old fisherman trail steps that were just cleared. The 7 members of the Diaz family from Texas enjoyed their service day gathering Naupaka seeds and planting Pili grass. John, age 13, said it was "a good experience with his family." 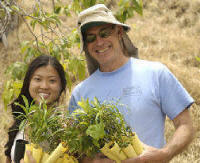 Cherie volunteers to preserve native Hawaiian plants. Welcome to volunteer-on-vacation-Hawaii. com! Please visit our Hawaii vacation volunteer projects page for information on programs where volunteers can donate their time and work to worthy causes in Hawaii and earn a 5% discount on their stay at the Hale Hookipa Inn Maui Bed and Breakfast (more details below). These other organizations sometimes need volunteers. They may be the perfect fit for you. We have plenty of opportunities for Hawaii vacationers to lend a hand while they're here! The Hawaiian concept of Laulima translates to "many hands." Laulima is how we carry the canoe to the water, how we clean old nets off the beach, how we clear the grass and replant the native forest, how we pass rocks one hand to the other to repair the fish ponds. These activities give us the opportunity to meet new people, use our skills, learn new ones, and to have fun while giving back to the islands we love. Kuleana is the Hawaiian word for responsibility. The aina and oceans of Hawaii have given me a rich life, and participating in some of these projects is my way of giving back to the Hawaiian culture, environment, and community that have given so much to me. Volunteer-on-vacation-hawaii.com is a gathering place where people can get information about volunteer opportunities in Hawaii. Many projects have been on going for years, and the fruits of that labor is now wonderfully evident. Secure a reservation prior to the scheduled work day, and show up prepared with water, and the protective gear you may need. Come enthusiastic, willing to pitch in, and consider yourself very fortunate in being able to participate in restoring and preserving our unique environment. Meet amazing people from here and afar. I hope to see you out there! Earn A Discount on Your Stay! 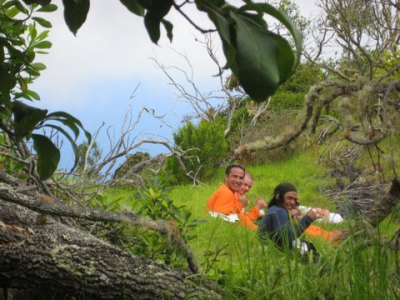 Working side by side with kama'aina and visitors inspired me to create volunteers-on-vacation. As the owner of Hale Ho'okipa Inn Makawao (noted for voluntourism efforts by O Magazine), I am delighted to offer my guests who volunteer on vacation on our beautiful island of Maui a discount on their stay at the bed and breakfast. I will discount your stay by 5% and donate 5% of the cost of your stay to the organization for which you volunteer. Hale Ho'okipa will provide coolers for lunch on service days. 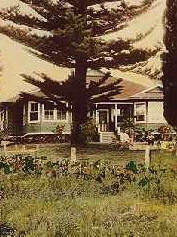 You can read about some of the great adventures, and add your own comments, on my Maui Hawaii blog: Ho'okipa Aikane (home sharing friend). Let's talk story and see what you are interested in! 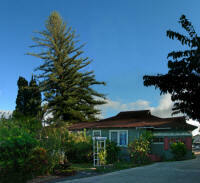 Volunteer on Vacation in Hawaii is © 2009-2010 by Cherie Attix and is sponsored by: The Hale Hookipa Inn Maui Bed and Breakfast in Makawao, Hookipa Aikane (home sharing friend) Maui Hawaii Blog, Bald Mt. Press, Green Maui Weddings from Paradise Maui, Kona Comfort Gourmet Organic Kona Coffee, Hawaii Stuff, Supak free desktop wallpaper, and Nealon Ohana.